4.2.3.10 The statement of activities distinguishes between governmental and business-type activities. Eliminations are required between and within the fund/programs of the primary government, (Eliminations). There are no eliminating entries between the primary government and the discretely presented component unit. These transactions are considered external ones and the receivables/payables between them should be reported as a separate line item. Internal service funds are not reported on the statement of activities unless they provide goods or services to entities outside the primary government. See Internal Service Funds. 4.2.3.20 At a minimum, the statement of activities should present activities accounted for in governmental funds by function. A function is defined as a group of activities aimed at accomplishing a major service or regulatory responsibility (e.g., general government, public safety, etc.). All functions of a government have expenses. Some functions generate revenues. 4.2.3.40 Report all expenses by function except for the special or extraordinary items and transfers. At least, the governments should report direct expenses for each function. Direct expenses are those that are specifically associated with a service, program, or department and, therefore, are clearly identifiable to a particular function. All expenses reported in the enterprise fund financial statements (except special and extraordinary items) should be reported in the business-type activities function as direct expenses for that function. 4.2.3.50 Indirect functions, such as general government, support services or administration should report expenses, which are indirect for other functions as their own direct expenses. However, local governments may allocate some or all indirect expenses to other functions. If governments choose to allocate some or all indirect cost, those expenses have to be reported in a separate column in the statement of activities. A total column of direct and indirect cost is optional. 4.2.3.60 The government should be careful in determining what level of details it will present in the statement of activities. Programs may be presented for all or some functions. The statement, when too detailed, may be overwhelming for its users. The same level of detail is not required for each function. 4.2.3.70 Deprecation should be also reported in the statement of activities. Governments can use any systematic and rational depreciation method. Depreciation expense for capital assets that can be specifically identified with a function should be included in the direct expenses of that function. Depreciation expense for shared capital assets should be allocated to the functions sharing the assets. If a capital asset (e.g., city hall, etc.) serves essentially all functions and is not practical to allocate the depreciation to all these functions, that expense should be reported in a separate line or as part of the expenses of general government function. If a government chooses a separate line, it should clearly indicate that this line excludes the direct depreciation reported in the specific functions. Depreciation may be also allocated through a separate indirect expense column. 4.2.3.80 The interest on general long-term debt should be reported as a separate function. The interest should include interest on bonds and notes, capital leases and other vendor financing arrangements, claims and judgments, pension related debts and employer net pension obligations. In extreme situations, when the borrowing is essential to the creation or continuation of the program and omitting interest expenses would be misleading (e.g., loan programs, etc. ), the interest on general long-term debt can be reported as a direct expense. In that case the line should be clearly labeled to indicate that not all interest is reported here. Interest expenses in the enterprise fund financial statements should be reported as direct expenses for those functions. 4.2.3.90 Classification of Revenues and Expenses for the Statement of Activities provides a table showing BARS account codes and related functions. The local government may use this matrix for the preparation of the statement of activities. Some governments may not perform all listed functions. 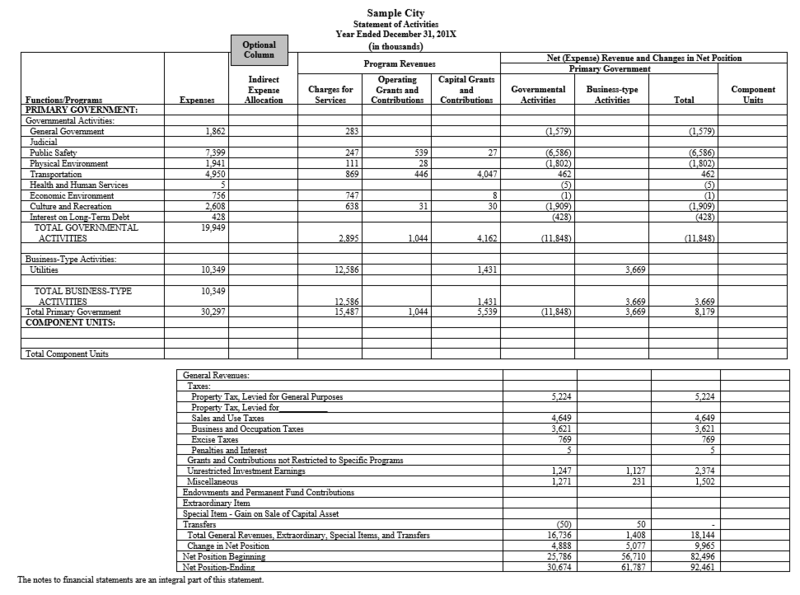 4.2.3.100 Revenues are reported as either program revenues or general revenues. Program revenues are generated directly by the program itself. Non-exchange revenues (except taxes) are program revenues if restricted to a specific program(s) or if unrestricted, should be reported as general revenue. Taxes are always general revenues even if restricted to a specific program. Revenues from the government itself are usually general revenues (e.g., revenues from investments). 4.2.3.110 Program revenues reduce the expenses of the function/program, which generates them, and show the net cost of the function/program to be financed by the general revenues. They should not be allocated to multiple functions (there may be an exception for grants that are restricted to several programs). Program revenues include charges for services and program-specific operating and capital grants and contributions. 4.2.3.120 Charges for services are to customers who purchase, use, or directly benefit from the goods, services, or benefits. The charges generally result from exchange or exchange/like transactions. They include fees for services, licenses, permits, fines, forfeitures, special operating assessments, and charges for interfund services, etc. Charges for services should be reported net of any uncollectible amounts. Charges for services are program revenues of a function/program that assess the charge even if the money is required to be spent on a different function/program. Operating revenues reported in the enterprise fund financial statement should be reported as charges for services of business-type activities. Nonoperating revenues with the exception for taxes and investment income should be also reported as program revenues. The operating grants and contributions are used to finance operations of specific function/program and should be reported separately from capital grants and contributions. Capital grants and contributions are restricted to purchasing, constructing, or renovating capital assets associated with a specific function/program. Unrestricted grants and contributions should be reported as general revenues. 4.2.3.140 Earnings on endowments or permanent fund investments should be reported as program revenues if restricted to a program or programs specifically identified in the endowment or permanent fund agreement or contract. Also, earnings on investments not held by permanent funds may be legally restricted to specific functions or programs. Those earnings should be reported as program revenues. 4.2.3.150 General revenues include all revenues and gains that do not meet the definition of program revenues. The one exception is that taxes (including taxes levied for very specific purposes) should always be reported as general revenues. Taxes should be reported by type of tax (sales, property, etc.). General revenues also include gains from routine selling or disposing of capital assets. General revenues are reported in the statement of activities after the total net expense of the government’s functions. All general revenues, including taxes, should be reported net of estimated refunds and uncollectible amounts. 4.2.3.160 Shared revenues and entitlements should be reported in the same way as grants and contributions. 4.2.3.170 Special assessments revenues should be reported as program revenues either as charges for services (operating special assessments) or as program-specific capital grants/contributions (capital special assessments). 4.2.3.180 Investment income (including realized and unrealized gains and losses) should be reported as general revenues. There may be exceptions if there are some specific restrictions placed on it (e.g., legal restrictions in permanent funds investments or restrictions on earnings on grants, etc.). Investment income reported in the enterprise fund financial statements should be reported as general revenues in the business-type activities column in the statement of activities (unless the investment originated from grants or contributions). 4.2.3.190 Classification of Revenues and Expenses for the Statement of Activities contains a matrix of BARS account codes related to revenues and functions has been provided. This matrix designates each BARS code as a program or general revenue. 4.2.3.200 Separate columns should be used to identify net program (expense) revenue for each function/program category of governmental activities and business-type activities and for discretely presented component units. 4.2.3.210 Contributions to term and permanent endowments and permanent fund principal should be reported in a separate category after general revenues. They cannot be used to finance any function/program so cannot be reported as a reduction of functional expenses. 4.2.3.220 Extraordinary and special items should be reported in a separate category after general revenues and endowment and permanent fund contributions. Extraordinary items are transactions or other events that are both unusual in nature and infrequent in occurrence. They are also not within control of management (e.g., environmental or natural disasters, etc.). However, transactions which are unusual and infrequent but within control of management should be also reported as extraordinary items. Special items are significant transactions or other events within control of management that are either unusual in nature or infrequent in occurrence (e.g., sales of certain governmental capital assets, early retirement program, significant forgiveness of debt, etc.). Transactions or other events that are either unusual or infrequent but not within control of management should be disclosed in the notes to financial statements. Before classifying a transaction or an event, as extraordinary or special, government should assess its materiality and significance in the context of financial statements in which it would be presented. Something that is significant or material in the fund financial statements may not be significant or material in the government-wide statements. 4.2.3.230 Transfers within the governmental or business-type activities are eliminated. The net amount transferred between the two types of activities should be reported as a single line after special items. Also interfund payments in lieu of taxes (PILOTs) that are not payments for services (or are not a reasonable equivalent of the value of these services) should be reported as transfers. Determining whether an activity is different may require the use of professional judgment.